Pisces Fish Machinery is one of the leading manufactures Sea Bass and Bream processing equipment. Pisces has installed filleting line in Greece, Turkey, Italy Spain and Croatia to process Sea bass and bream. 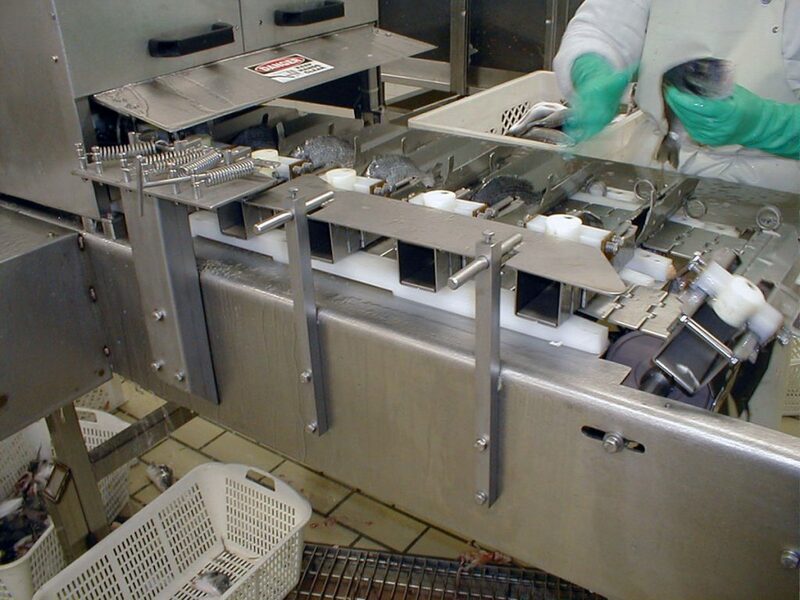 Pisces turnkey line produces fillets from whole fish efficiently and economically. Pisces lines are sold and service in conjunction with Mekalis in Greece and FPT in Turkey. The DS series drum scalers by gently tumbling the fish in a rotary drum. 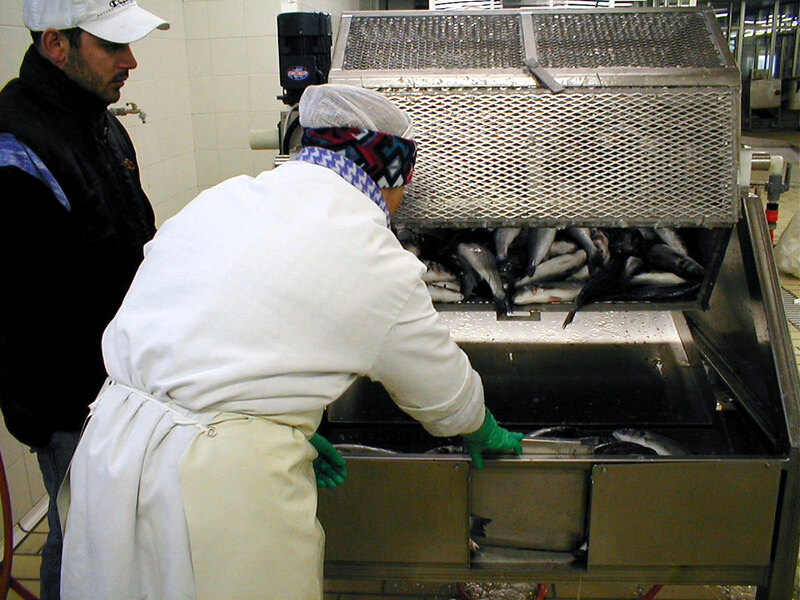 All of the machines time the process to ensure that the fish remain undamaged. The machine range in automation from the stand-alone DS-150 or DS-300 to the PLC controlled DS-400 and DS-500. The DS-400 and DS-500 can be incorporated in to automatic feeding systems which greatly increase their through put. A stand-alone filleting machine for head off Sea Bass or Sea Bream for the size range 200 grams to 600Grams. The FR 200 incorporates an evisceration system and operates at speeds up to 40 fish per minute. Often used in conjunction with a Head Cutting Machine. A stand-alone filleting machine for head off Sea Bass or Sea Bream for fish larger than 600 grams. Like the FR-200 the FR-3500 incorporates an eviscerating system in the machine. The FR-3500 uses Pisces 6 blade backbone removal system and PLC controlled rib removal. This provides higher yields on a Sea Bass or Bream I larger than 600 grams. A stand-alone head cutting unit for fish in the size range 200 grams to 1 Kgs. Each fish is individually located to ensure optimum position irrespective of size. A vee cut configuration ensures capture of the meat at the top of the head above the gill plate. Often used to prepare fish for the FR 200 filleting. Can be supplied with vacuum evisceration for enhanced Hygienic operation and is an integral component of the AHF 225 single operator system. The HV-30 combines the gill location method with the ability to move the intersection point of the head cutting blades relative to the size of the fish. This allows for the intersection point of the blades to line up with the backbone of the fish no matter the size of the fish. Having the blade intersection in the right place is critical to ensure a high yield across a large size range. Using Pisces BC-11 Belly opening machine in conjunction with manual vacuum gutting table, the line can produce head-on gutted fish from both Sea Bass or Bream over a large size ran with minimal adjustment. Pisces offers the Varlet V1558 adjustable automatic deep skinning machines for Sea Bass and Bream.